Prime Minister Theresa May launched a desperate appeal to Conservative Party lawmakers to unite behind her derided Brexit plan as she prepares for a return to Brussels for more talks with European Union leaders. 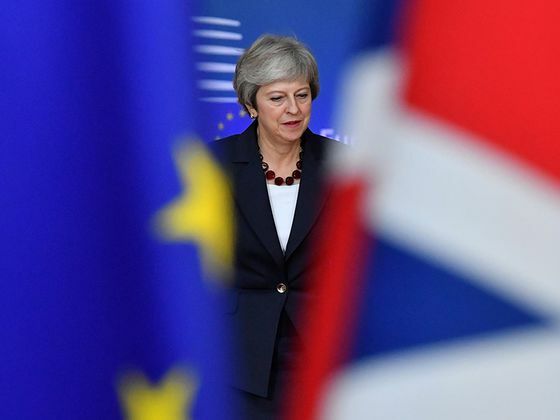 In a letter to her party’s lawmakers, May said she’s planning to meet with European Commission President Jean-Claude Juncker and speak to the leader of every EU member state in the days ahead. Gaining headway in Brussels will depend largely on whether she can show a united front at home. The consequences of the impasse in Parliament were further highlighted this weekend, after British regional airline flybmi ceased operation, partly blaming uncertainty surrounding Brexit. In a BBC interview on Sunday, Katherine Bennett, senior vice president of Airbus SE, said a no-deal outcome would be “catastrophic” and reiterated the plane maker’s warning that it would have to consider future investment in such scenario. Still, the Sunday Times suggested May’s rhetoric won’t work. It said Steve Baker, deputy chairman of the euroskeptic European Research Group, told his colleagues that Brussels and London were pretending to negotiate while running down the clock so May’s Brexit deal can be forced through parliament. Brexit Minister Chris Heaton-Harris rejected that on Sunday, telling Sky News that there’s a “huge amount” of activity from the government in trying to secure a deal, citing trips to Brussels by May and other senior ministers in coming days. May has been forced to return to the EU after lawmakers rejected her deal by a huge margin on Jan. 15, and another vote last week failed after a hard-line group of Brexit-backing MPs shot down any hopes May had of getting it approved. One senior member of May’s administration has said she probably has two weeks to save her deal before the House of Commons takes the process out of her hands, in a vote scheduled for Feb. 27. May urged all sides to make compromises, or risk a situation in which Brexit doesn’t happen -- a state of affairs that the prime minister says would undermine British democracy. The key issue remains the Irish backstop -- the arrangement designed to ensure there’s no physical border on the island of Ireland. On Tuesday, Attorney General Geoffrey Cox will set out what changes are needed to ensure the U.K. isn’t trapped in the backstop arrangement indefinitely. Speaking in a BBC interview on Sunday, Culture Secretary Jeremy Wright said there are a number of different ways to secure changes to the arrangement, with the objective of removing a permanent backstop being more important than the mechanism. One idea being considered could involve fleshing out a set of agreed criteria that could allow the U.K. to exit the backstop after regular reviews. Pro-Brexit members of May’s Cabinet would be willing keep Britain tied to the EU’s customs regime for as long as five years in an effort to break the deadlock in divorce talks, people familiar with the matter said.